Senate Majority Leader Mitch McConnell spoke at a weekly news conference in Washington on Tuesday, the same day as double headlines about Paul Manafort and Michael Cohen — but McConnell declined to comment on their legal troubles. Congressional Republicans stuck by President Trump Wednesday, one day after one of his former top associates was convicted on federal charges and another pleaded guilty to eight criminal counts, implicating Trump in payoffs to two women in the lead-up to the 2016 election. On Tuesday, former Trump campaign chairman Paul Manafort was convicted of eight counts, including tax and bank fraud and failure to disclose a foreign bank account. Shortly thereafter, Trump's former personal attorney, Michael Cohen, pleaded guilty to eight felony charges, including campaign finance violations and tax evasion — all while saying Trump directed him to make the illegal payments. The charges against Manafort and Cohen are the latest fallout from the ongoing investigation of special counsel Robert Mueller into potential collusion between the Trump campaign and Russia in the 2016 election. The serious charges were widely seen as a severe blow to Trump just months before the critical midterm elections in November. But Republicans on Capitol Hill downplayed the charges or declined to comment entirely. 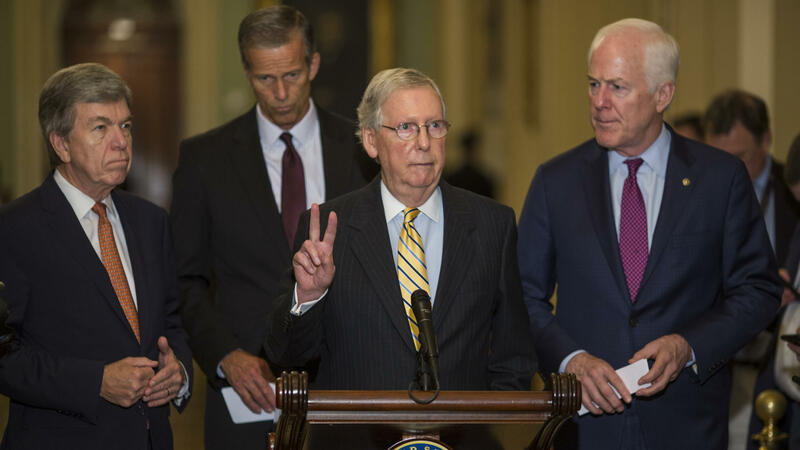 Senate Majority Leader Mitch McConnell did not respond to any questions from reporters on the issue. His top deputy, Sen. John Cornyn of Texas, said the charges were unrelated to Trump himself. "When you appoint an independent counsel or special counsel they typically get involved in collateral matters," Cornyn said. "Nothing that happened yesterday or to this point has indicated collusion or any involvement of the campaign." The vast majority of congressional Republicans repeated similar claims. House Speaker Paul Ryan, R-Wis., did not comment directly on Cohen or Manafort. A Ryan spokesman issued a statement saying "We are aware of Mr. Cohen's guilty plea to these serious charges. We will need more information than is currently available at this point." Those comments echo the White House's position that Trump was not involved in the wrongdoing of his former associates. White House press secretary Sarah Sanders told reporters Wednesday that "the president has done nothing wrong," and there were "no charges filed against him." But others on Capitol Hill acknowledged that Cohen and Manafort could seriously damage GOP prospects in the upcoming election. Sen. Lindsey Graham, R-S.C., bluntly told reporters that Tuesday's events were an issue for any Republican on the ballot in November. "We'll have our side of the story but you don't have to be a political genius to understand stuff like this doesn't help," Graham said. "It's just one more narrative of people around the president doing bad things." Democrats are happy to seize on that narrative — but they're taking great pains to do so without mentioning the word impeachment. House Minority Leader Nancy Pelosi, D-Calif., issued a carefully worded statement Tuesday evening calling the conviction and guilty plea "further evidence of the rampant corruption and criminality at the heart of Trump's inner circle," but stopped short of calling for him to be removed from office. Instead, Pelosi and nearly every other Democrat in Washington talked about supporting the Mueller investigation and attacked the GOP for fostering a culture of corruption. "Congressional Republicans' determination to cover up for the president and his criminal cronies betrays their oath of office and undermines their duty to the American people," Pelosi said. "House Republicans must abandon their complicity with President Trump and affirm that no one is above the law." Both parties did agree that Trump should not consider a pardon for either Manafort or Cohen. "It would be an enormous mistake and misuse of his power to pardon," said Sen. Susan Collins, R-Maine. Republicans and Democrats offered similar warnings: A pardon for either would be a grave mistake. None of the lawmakers would discuss the potential consequences of a pardon for either Trump associate, but Graham, a senior member on the Senate Judiciary Committee, warned it could cause political trouble for Trump. "You've got to earn a pardon," said Graham. "I think it would be seen as a bridge too far."